Don't forget to watch Springwatch next week. We had Iolo Williams and the crew aboard Lady Jayne in the most fabulous weather to film the White Tailed Sea Eagle on Mull. They got some great footage which should be shown Weds/Thurs of next week. 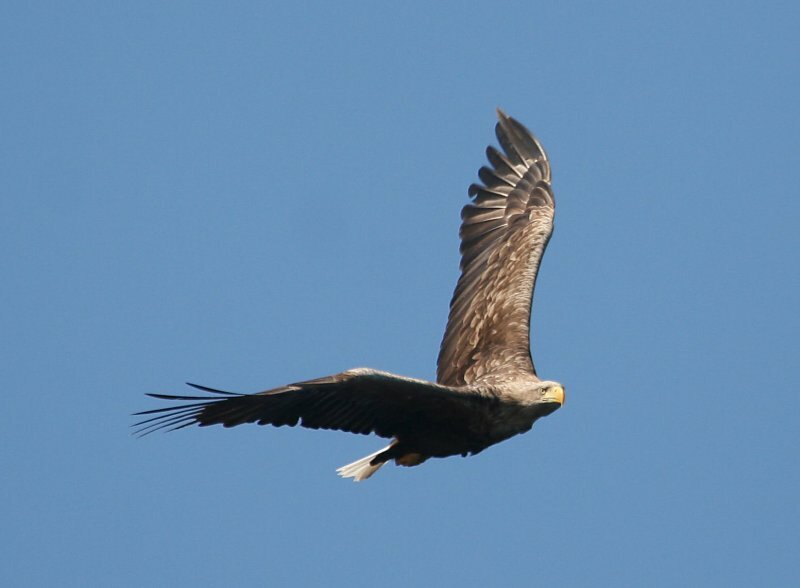 Just to let you know that Mull Charters will be keeping you up to date regularly with sightings, catch reports and pictures on the facebook page. Just click the link on the site, you don't need to join facebook to view the page but if you are, click ''like'' to get the notifications. You can also upload your pictures to the timeline in order to have the chance of winning an exciting prize of a free boat trip or free B&B in Fascadail. Well all the hard work has paid off and L J looked splendid as she sat on her own mooring for the first time in 2012. The new echo sounder performed perfectly on the trip around the north of Mull and has already highlighted some new fish holding grounds for us to explore later. There were plenty of birds about too with loads of Black Guillemot, Guillemot, Razorbill, Puffin, Gannet and Shag around the headlands. Our first job was to load all the bits and bobs aboard such as life jackets (new lights) drogue seating etc, We pulled away from the pier to let the Ulva Ferry alongside and motored a short way down the Sound, as we sorted out the wheelhouse a pair of Red Throated Divers landed on the water 50m away, surely a good omen. A cruise into the loch allowed us to initialise the replacement autopilot which was fitted last year but unable to be used due to other issues. This will take some of the strain off the helmsman and save us some fuel as well. Tomorrow we start taking passengers and have a few excited people to pick up for our first trip, hope they have wrapped up warm it is freezing today. Because of the temperature we will be serving hot chocolate to keep those fingers toasty warm. Lets hope for some serious Eagle action. During 2012 We will be running a competition to see who has taken the best pictures on one of our trips. These can be stills or video any format but must be posted on our facebook page for all to see. 1st prize will be a 2 night stay (twin or double) for 2 at Fascadail including breakfast. 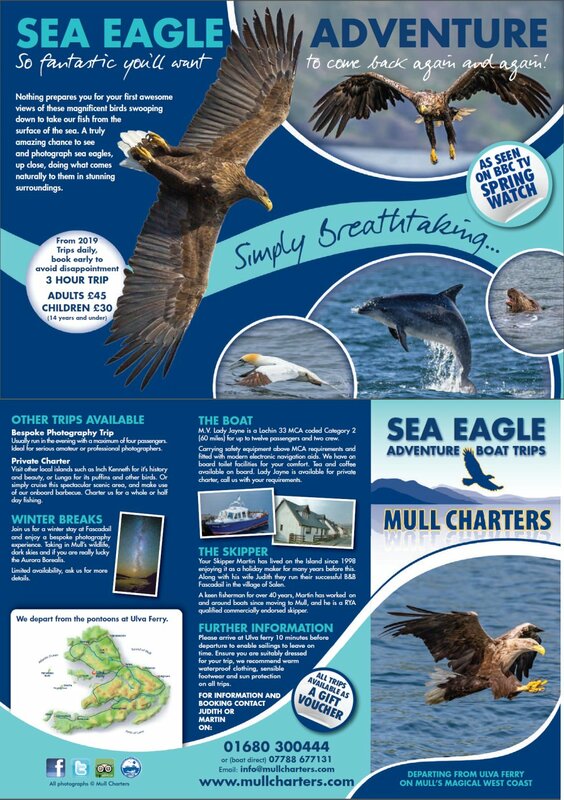 Runner up prize 2 places on one of our Sea Eagle Adventure trips. Who says Yorkshire folk are tight? Come on let's see what you've got! 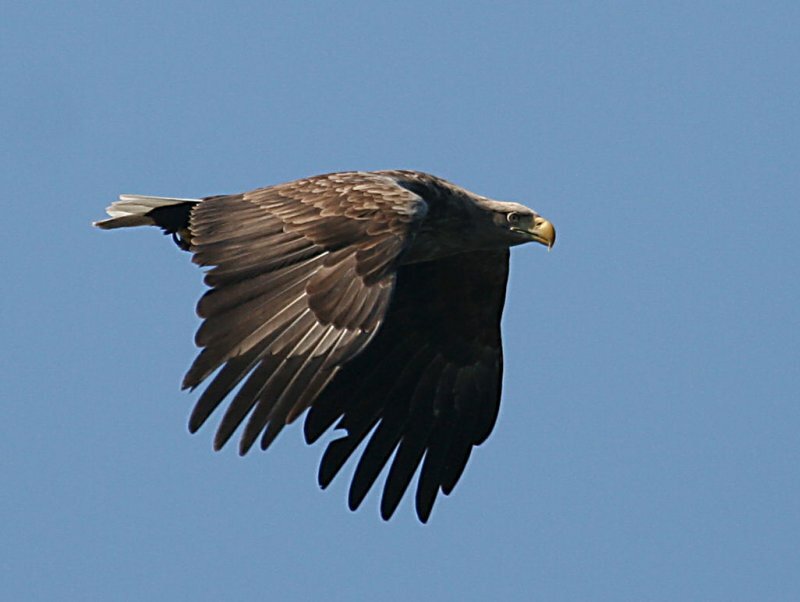 For those of you who follow the lives of our Sea Eagles here on Mull we are approaching the most exciting and sometimes frustrating time of the year. Currently pairs of Sea Eagles across the whole of the West Coast will be looking for mates or re-confirming current and sometimes long standing relationships. This can entail sitting close together by the nest sites,sprucing up existing nests, preening or prospecting and building in never before used areas. Out of the 2 pairs we visit I have only had a chance to observe the loch pair. I visited the area a few days ago and after scanning a few favourite perches soon spotted a familiar figure sat high on a pine tree scanning the surrounding area. When our male was satisfied that the area was threat clear he flapped along the trees and landed close to the nest before dropping from view. I have to be honest here and say I was pleased they seem to be choosing their most successful site of recent years. I watched for about 40 minutes getting occasional glances of a white tail as a bird seemed busy at the nest rearranging branches. I saw a bird drop from the tree and glide toward the loch and soon realised it was being closely followed by another slightly larger bird, probably the female although I couldn't distinguish the 1 remaining tag she has carried for years. After a few minutes gaining height and circling their familiar home amongst the trees they headed out across the loch and gaining height steadily were soon lost from view. Sea Eagles like many birds can have several nests in a territory and will often re-build 2 or more before finally choosing the one they intend to raise their young in. In areas where birds have lived without interruption from man territories can sometimes be occupied for a century or more and if a favourite nest is continually used, the build up of branches grass sods bones etc over this period of time can lead to a catastrophic collapse of the chosen tree! Another hazard of living in a tree is the wind, fortunately our loch pair seem to have a nest site which has been protected from the worst of the winter storms. I heard recently from a reliable source that the wind speed at the end of the loch had been measured at a constant 111mph and that a gust over the Glen More Rd had been recorded at 143mph in the early December storm. It is not uncommon for nests or chicks to be blown out of trees bringing a sad end to that seasons breeding attempt. Large birds such as Eagles do not have the time to attempt to breed again if their season is disturbed by such events. Hopefully I will soon be able to report that the birds have been seen breeding in their chosen site. This is usually followed by a lot of calling by both birds and if you are ever lucky enough to witness this you will realise that secrecy is not part of the plan. The birds can be heard calling for up to a mile away and usually sit high up on a tree, side by side with heads thrown back, beaks open and throats vibrating with the high pitched squawking call. I have only seen this a few times but it is something that I will never forget and still feel privileged to have witnessed. The rest of today will be spent catching up on a few jobs I have missed having been away on a survey between Islay and Ireland for the last few days. It was really quiet bird wise with only a few species and nothing of note seen. There were only a few porpoise to break the monotony of steaming across an empty sea. It also my eldest sons birthday today, many of you will know Alex from his excellent tea and coffee making skills aboard Lady Jayne on one of our trips, 15 already, where does the time go? For those of you that have never been to Mull outside of the summer months you wouldn't recognize the place now. Plenty of rain of late and strong winds/gales forecast for the next few days. The trees are now bare of leaves and the grass and bracken have taken on their winter hues. It is not all doom and gloom though, even though the days are getting quite short we have still been getting out and about. Lady Jayne was delivered to Balvicar last week for her annual lay-up. The journey was perfect, calm and sunny weather and the Cuan sound was timed to perfection. I've also managed a few fishing forays lately, both from the shore and the dinghy. Not much fish about except decent Pollack and very small Coalies. It is only a few weeks since we had Mackerel boiling at the surface of the loch chasing Sprats but they have disappeared now. The wildlife has been most accommodating, Otters are much easier to see at this time of the year and most times when I go out I see at least one. The Red deer rut finished some weeks ago and the nights are quiet after the roaring of the stags has ended. Our Sea Eagle families will soon be dispersing, who knows where our chicks will end up but we hope we have given them the best start in life possible. It will be about 5 years from now when they will be looking to find mates and territories, it is usually then when we find out where they are settling down and how far they have travelled. There is quite a bit of work to do on LJ this winter, I still have to fit a new steering ram and helm pump and commission the new auto helm. The usual general duties will have to be attended to too, cleaning and painting being the most time consuming. If I have time and funds a new fish finder will be fitted to help find the shoals of fish, either for us to catch or indicate where wild life is likely to be. I am already looking forward to next year and meeting friends old and new and wondering what adventures we will be having together in 2012, roll on April! Oh and if you have a few days and nowhere to go, head to Mull, you will have the place to yourself and the wildlife is great. It seems a long time since I last updated you on our adventures so here is few lines to let you know what has been happening. The general bird scene has been pretty quiet recently with our summer visitors heading to warmer climes or back out to the ocean again. Thankfully our 2 White Tailed Sea Eagle families have been thriving throughout and both sites have well grown chicks flying well. Our usual site has continued to delight with good close views of birds taking fish and distributing them to hungry youngsters. Our alternative site has also given some lucky guests amazing views of these fantastic birds. In both areas we have been seeing Golden Eagles on a fairly regular basis and are pretty sure that we have some new additions to the GE population. Since our Sun Fish encounter we haven't seen much in the way of rarities but the Common Seals on the reefs have been showing well depending on the direction of wind. The Grey Seals will now be out at the islands getting ready to pup and mate. Our major problem of late has been the weather! We have had a succession of Atlantic lows moving in causing unsettled conditions keeping us tied firmly to the mooring. I feel sorry for all the people who have been waiting patiently for a break in the weather only to be told that conditions are not suitable until they have left to go home. A real shame for them and us but we look forward to seeing you next year. We intend running the trips as weather allows until the birds start to move inland as winter approaches, as long as we get good views and happy customers then we will continue. On another note I had a recent trip to Bulgaria in particular to the Persina Nature park where they have a couple of WTSE territories. They have fantastic potential with Black and White storks, Pygmy cormorants, all the European Herons and Egrets and many more species and Bulgaria's biggest RAMSAR site. I was hoping to be able to share information on tourism issues with the people running the nature park but quickly surmised that all the learning was going to be one way. They could certainly use input from the WTSE partnership here on Mull. They have a fantastic state of the art visitor centre which attracts only 600 people per year! Compare that to the Eagle hide on Mull which has C 6000 visitors per year and larger reserves which can have 40000 and you can see how underused it is. However, as the Soviet influence fades and people become better educated on wildlife preservation I am sure Bulgarians like Britons will realise the potential wildlife can offer both as a leisure activity and source of business revenue. Thats it for now, the sky is brightening, rain finished? we will see. Got a real shock this afternoon when a Sunfish surfaced outside the wheelhouse window. Everyone aboard had a fantastic view for about 10 seconds as it swam just below the surface in the clear water past the side of the boat. Had a few people enquiring what the latest news is and now I can tell you! Dave Sexton has located Kellan our 2010 WTSE that was found badly injured and nursed back to health. Nice on Dave. For the full story see Dave's blog on the RSPB Mull Eagles site. PS Lifeboat day in Tobermory - we're off to enjoy the day and support a very worthwhile cause. Wow what a week! We started on Monday with some of the best views of the year and it just got better each day. First trip of the week and our regular male was an absolute star, taking several fish in quick succession as the female flew overhead keeping a watchful eye on proceedings but not venturing low enough to beat the gulls to the fish herself. Wednesday and a late start, as we passed an island in the middle of the loch we had good views of a juvenile sat on the shore while an unidentified adult male flew high overhead. As we approached our usual site the male flew to meet us and soon took a couple of fish back to the waiting youngsters. The weather on Thursday was very still and the sea glassy calm. We visited our alternative site and had excellent close up views of that particular male collecting fish and taking them back to it's very vocal youngster. We cruised off to give the birds some privacy and have a cup of coffee but were surprised mid slurp/dunk as the bird approached us again and took another fish, keeping this one for himself. All this while Golden Eagles soared along the ridges and Red Dear and wild Goats were visible. After lunch and a quick changeover of passengers we headed out for a spot of fishing. A we hauled up some plump mackerel we could see a pod of Dolphins heading our way. Soon we had to reel in our gear as they came in close to investigate us. We have no idea how these amazing creatures view us but they always seem grateful if we put the boat in gear and steam about randomly. These particular animals enjoyed our bow wave and wake jumping clear of the water and rolling right under the bow blowing water up onto the windows, rolling onto their sides to watch us as we watch them. Today we had a cheeky sub adult sneak in under our watch and attempt to fly down a gull which was hanging about the boat. The regular male was incensed by having another bird on his ''patch'' and flew in to drive the intruder away several talon to talon tumbles ensued ending in the adult crashing into the juvenile with such force we could hear the contact from the boat. It didn't phase our regular bird at all and we were treated to some skillful fishing displays as he took 3 fish back to the perching area. We also had great views of this years chicks flying and chasing each other through the trees, with the adults in hot pursuit. Today one chick had a length of something white trailing from it's talons while the female (YBS) had several long lengths of grass in one talon, clearly some WTSE game or other. As we passed Eorsa our suitably chastised juvenile was easily spotted perched on his favourite headland. This time he managed to get the offered fish without being chased away. Hopefully he has learned his lesson. Sorry for the long ramble but I really wanted to keep you all up to date. PS Might have some more exciting news to report in the next few days, keeping fingers crossed!!!!!! My second post in as many weeks! I just had to share a few of our recent trips with you. Friday we had a regular customer and his family and friends take the boat for the whole day. 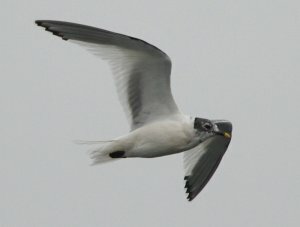 First we headed toward one of our WTSE sites and were met halfway by a huge apparition flying directly toward the boat. It was the female of the territory looking for a freebie. We left a fish in our wake and watched as she gently lowered herself out of the sky and picked up the fish. It is remarkable how the birds from different territories adapt different techniques to suit their flying style. She soon passed us as we headed in the same direction. After a short while we could observe her eating the fish for herself on top of a nearby crag. As we watched another bird which had remained unseen launched itself off the cliff and in our direction closely followed by the first bird not wanting to miss out. We put another fish in the water close to the first and stood in amazement as both birds came down at the same tome to collect the fish. Simply fantastic! We had a bumpy passage to Iona via the interesting passage known as the Bull Hole before landing at the pier where our guests went ashore for lunch and the crew ate their sarnies. Afterwards we headed toward Staffa to get some pics of the famous Fingals Cave. On the way we spotted large rafts of Manx Shearwater and soon after the distinctive back of a Minke Whale.We watched for about 15 mins as this huge creature swam and dived about the boat. Fingals cave was photographed and we headed north to Gometra, en route a pod of Bottlenose dolphins joined us for a short while before going away to feed making everyone excited. After a brief stop to catch some mackerel for their supper our lucky guests enjoyed a tranquil cruise up Loch Tuath to end their exciting day aboard Lady Jayne.Everyone was thoroughly delighted at the range of wildlife we had encountered and any thoughts of rough seas soon vanished. Just a Quick update on our WTSE families. Our regular family on the Loch Na Keal territory have fledged both their chicks within the last week. The parents are now feeding the hungry youngsters at different locations but still in the same general area. This has meant that the female YBS (yellow black spot) has had to get involved as well. On our last two trips she has taken a fish each time and we are hoping that this will become a regular thing. Our alternative site also has a young eagle on the wing, a dark brown bird was seen sitting on a favourite perch and observed us for a while before flying well to a crag up on the hillside. Both the male and female are still coming to the boat together when in the territory and performing synchronized fish grabbing to the delight of our passengers. I recently got a new phone which has quite a good camera so have been able to take some footage which I have put on Youtube. Follow the link or paste it into your browser for a real treat or reminder of what we do. We have been very fortunate here on Mull to be having the best July weather for years. Some lucky people have also been very fortunate to book themselves on possibly the best wild life trips anywhere! I know it is a bold statement but some of our guests have been so impressed they have declared it is the best trip they have ever done. When quizzed they have been on such different trips as whale watching in Canada and White Tailed Sea Eagle trips in Norway and they say that Mull Charters trips can compete with the best. Personally I don't make such claims but I do know that people leave us with a sort of glow that they didn't come aboard with. Recently we have been running daily Sea Eagle adventure trips and having spectacular results. On most trips we have been having multiple visits from these impressive birds and seeing both male and female eagles and occasionally newly fledged chicks. Yesterday and today we have also had amazing views of Dolphins close to the boat. Dolphins are the most enigmatic of our sea creatures and always respond to the watchers enthusiasm. Please have a look at the videos I have posted on Youtube, my channel name is keivers. Hope you enjoy them. Had a fantastic day today Eagles are in fine form coming close to the boat to take fish. We trying to keep everyone happy and were asked to run a special evening trip which we managed. Our reward was a memorable 30 minutes of Dolphins cavorting round the boat, leaping and playing like only Dolphins can. Enjoy the pic. The big hurries of birds we have been having in the loch have had a dramatic side effect. 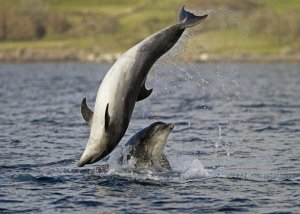 Yesterday evening we were on a private charter when the 3 lucky passengers were treated to a 20 minute display of cavorting Dolphins. It is not often we get good views of these wonderful creatures but the memories they leave last for years. Better weather this week, calm and settled (hopes). On the way back down the loch I saw a gull harrying an odd looking sea bird. It turned out not to be a sea bird at all but a Hen Harrier flying over the loch toward Eorsa. Time flies when you are having fun! Been having some great trips lately, amazing close up views of White tailed Sea eagles are keeping everyone happy. We are also getting some Golden Eagles as well, quite long range but it is always a pleasure to see these handsome birds. The seaward end of the loch has also been home to big ''hurries'' of sea birds lately. We can't quite find what they are feeding but have seen some shoals of very tiny fish? maybe that's it. Up to 100 strong rafts of mixed guillemots and razorbill on the water with diving gulls in attendance. We also had a manx shearwater and a red throated diver amongst them. Fishing trips are doing well we have been getting some good numbers of mackerel as the water warms up and mixed bags of pollack and coalfish, I bet there have been some tasty barbeques around Mull. Not the best combination! The start of Wild Isles week here on Mull has been windy. We ran a trip yesterday but have had to cancel today due to strong winds. We are all keeping our fingers crossed that the rest of the week calms down and we can run the planned trips. Tuesday we are going to do an Eagle Adventure in the morning and then in the afternoon we are taking a full boat to Inch Kenneth. As a special for this week we are taking Norma Dowling along and she will be on hand to identify any wild flowers people find. We have just had confirmed what we have suspected for a week or so. Our Sea Eagle nest has two chicks! From the males behaviour we had surmised that he would take every opportunity to get as much food as possible and take it back to the nest. Not surprising when he has two hungry mouths (and Mum?) to feed. This is great news for us and our guests as although we can never guarantee what will happen, it makes it far more probable that we will get more multiple visits from the hungry birds. Congratulations to Artur a recent guest aboard LJ. He managed to win photo of the week on www.birdguides.com with an excellent aerial shot of the male Eagle inverting prior to a dive. A few busy weeks coming up soon as the season moves into top gear. The Eagles will be under pressure as the chicks grow and their demand for more food increases . Let’s hope for less wind and some blue skies to brighten those pictures of the Eagles. This week we have had some amazing warm weather on Mull. Yesterday the wind was blowing so warm it felt like a hairdryer sometimes. Incredible for Mull at anytime, but most unusual in April, especially as we still have snow on Ben More. Thursday’s trip was in flat calm conditions and the female was sitting tight on the eggs. The male came and took two fish in spectacular fashion. When there is little wind these birds have to keep their speed up to grab fish from the surface of the sea. As we waited between visits we were treated to the sound of Cuckoo and divers calling, floating across the loch. Friday a SE wind made it quite difficult at times, thankfully the head of the loch was sheltered and we soon had a bird winging its way toward us. It only managed to grab a fish on the first visit, the second attempt it was thwarted by sea gulls nicking the fish when its back was turned! The countdown is on now, the embryo will hopefully be developing and the hatching drawing closer. Who knows if we will have one or two chicks this year. If it is two then the adults will have to work doubly hard to keep them fed. Some birds have already hatched on Mull, increasing the population by a few new birds. Whatever, we will be on hand to observe and maybe help out in our own little way. 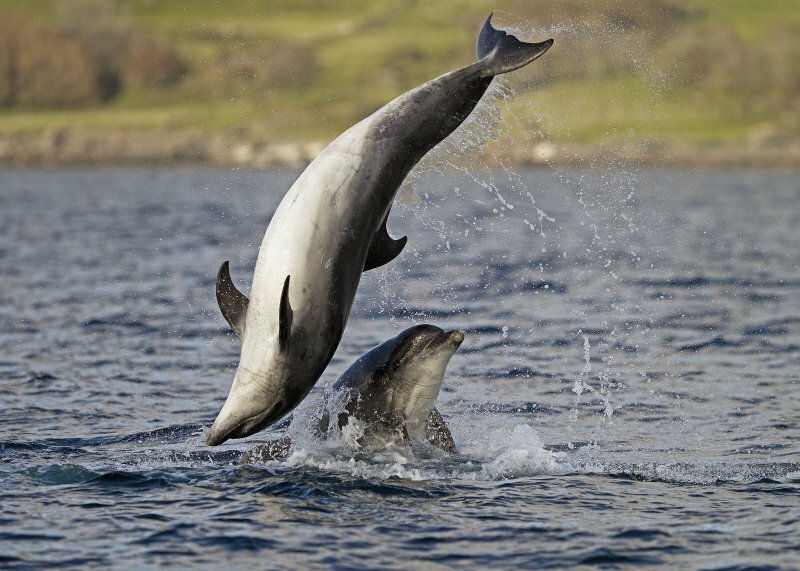 Come and join us for sites like the one below, taken this week aboard LJ by Mike Mallory of Mull in Focus. Firstly to those of you who read the Blog regularly my apologies! A few weeks ago it was apparent that there was something seriously wrong with it. We had been getting increasing amounts of spam comments which were getting to be a real pain as I have to approve or disapprove every comment. Then one day strange messages began to appear and we found we had a virus lurking within. Hopefully these new diary entries will keep you up to date with happenings here on Mull and especially with the Eagles. Firstly good news about Kellan, the chick which was injured last year. He is continuing to make progress and finding food on his own. While he isn’t out of the woods yet he is alive and feeding and getting stronger all the time. Flights are getting longer and stronger and he has visited other local areas although he is still hanging about Loch Na Keal and the area he knows best. Today we had our first trip to the areas we feed the eagles in and soon saw a bird sat in one of their favourite spots. Unsure if it was the male or female we waited for an hour or more and were rewarded with the sight of the birds doing a ‘’change over ‘’ It was then obvious that the bird which had been watching us was the female as the new arrival soon left his perch and flew directly to the boat. We had great views of the bird which circled the boat several times before swooping down to take a fish. Several hundred frames later and our happy customers revealed some of the best pictures I have seen to date. One concern that had been voiced in the past was that running our trips too early might result in the birds being drawn from the nest allowing the egg to cool. We were prepared to delay our start if this was the case but after today’s trip can say that these fantastic birds are exceptional parents and the male WILL NOT leave the nest for food unless the female has taken over in the normal way. Relief all round!